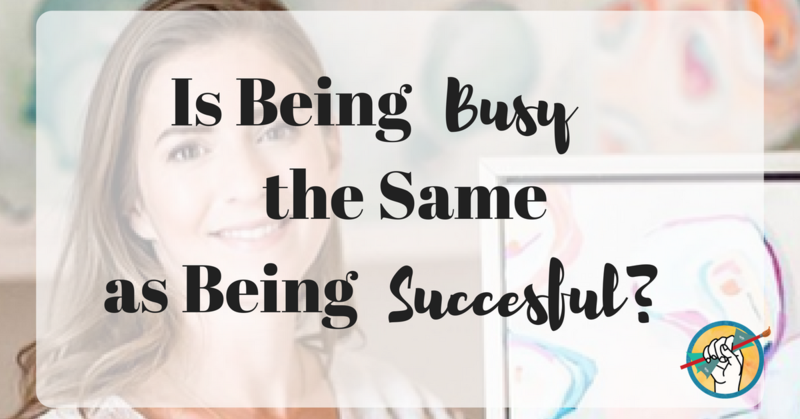 You are here: Home / Business Skills for Artists / Is Being Busy the Same as Being Successful? Is Being Busy the Same as Being Successful? Many creatives become so engrossed in the fun and exciting nature of their job that they completely ignore the business side of their…well, business. We’ll often wonder why someone who was so outwardly successful suddenly ended up closing up shop. You’re busier than ever fulfilling orders and living the dream. Your inbox is full and so is your voicemail. You’re busy busy busy and everyone knows it, so you must be successful, right? Well, maybe. This is a great time to take stock and do the dirty—running your numbers. It’s good to remember here (albeit no fun) that you don’t actually “earn” what you bring in. That’s your Gross Revenue. Once you subtract all Expenses you then have you Net Income (and for many artists/artisans, this is your salary). So I’ll caution you here, don’t be fooled off the bat by a big number and immediately pat yourself on the back for quitting your unfulfilling day job. It was probably still the right choice, but let’s make sure you’re getting paid properly. Oh barf. Math. I hated accounting in college and you probably did too, if you opted to take it. If you’re in the first year or two of business and have the ability to work from home, you may be skimping on some of the more formal aspects of your job as a creative—such as getting out of your pajamas, brushing your teeth, and accounting. Basic accounting is very simple. It’s important that your inputs (income and expenses) are accurate. You can use a system like Quickbooks, Cashboard or just an Excel or Numbers spreadsheet. Take the time and enter each expense and all sales/income. This kind of thing can be mind numbing, so as a good practice going forward I recommend tackling record keeping on a regular basis. My business allows me to handle this throughout the year every 2 weeks or so. Wait. I Worked my Tail Off for THAT? So now you’ve run the numbers and you might realize you’re in the group of creatives that’s saying “Oh F@#k.” Don’t panic. So you worked harder then you ever have before, putting in extra hours every week and you’re not certain you made minimum wage. Here’s how to begin righting the ship. Have an understanding of how much time it takes you to create each product or in my case, it would be a painting. This involves some boring old time tracking. If you don’t know how long something took in the past, don’t give up. Just start now. I like to round up to 15 minute increments when tracking my time to keep the math easy. Track them. If they’re over 50% you’ve got some work to do. A target for most creative businesses with a tangible product would be 45%. Photographers and Graphic Designers can get away with a much lower expense ratio. Keeping good records can be made easy with a simple system. The key is finding one that works for you. I personally keep an accordion file near my desk and once I’ve logged my income or expense in my spreadsheet, I put a checkmark on the receipt and file it away (The IRS loves entrepreneurs and we are more likely to be audited than those employed by a business. It’s wise to keep careful records going back seven years). I have simple category headers for my accordion file like “Utilities,” “Cell Phone/Internet,” “Education,” “Store Receipts,” etc. What I like about this system is that at the end of the year all of my records are in one place. I also keep other important items in there, like copies of my monthly Virginia Retail Sales Tax payments and my business license. It’s portable and easily goes with me to the accountant at tax time and is somewhat organized. There are many ways to get creative with this so grab a friend to help you brainstorm. Some basics would be to buy materials in bulk on sale, band together with other artists to buy supplies in a huge order from a wholesaler, look for savings on recurring web site fees by committing to an annual plan vs. month to month, or sharing studio space. Now that you know some rough numbers, check your pricing. Pick a product and analyze it. First, are you covering your hard costs with your pricing? Second, calculate how much you’re making per hour of work (or quarter hour of work if it’s not a time intensive product). How much are you paying yourself? Is that a living wage? How many would you have to sell to reach your salary goal? Is that a reasonable amount? Alter your price as needed and check it against similar products in the marketplace. I had a boss who used to say “Don’t Leave Money on the Table.” It roughly means, don’t lose money by being lazy. If you saw $20 on the ground, would you pick it up? It’s important to know your tax write offs as a business owner. If you have a dedicated studio space in your home you can write off a portion of utilities as well as some of your mortgage if you own your home. You can write off dedicated cell phones, mileage for travel, books, classes, etc. Make sure you’re tracking those carefully so you can take full advantage at tax time. If you’re running around fulfilling orders and it’s non-stop, it’s time to analyze your prices. It feels great to be busy and in demand, but if you don’t examine your pricing you can fall into feeling like a success because you’re busy vs. being financially sound. Once you’ve tracked your time and expenses you’ll know better what needs to be done. If you are covering your costs and earning your desired salary and are still crazy busy, then congratulations! Consider hiring help or raising your prices again to cut down on demand while increasing your revenue. If you realize you’re working for peanuts, evaluate the market in an effort to raise your prices. Beware: when you raise your prices you will lose some customers that can no longer afford you. This is the idea. It slows your workload down while allowing you to bring in more revenue. Take this opportunity to tune in to your new target market. Get to know them better and make sure you’re reaching them effectively with your marketing efforts. If you’re not paying yourself enough and raising your prices will price you out of the market for your product type, then it may be time to consider that this isn’t a profitable item unless you can find a way to cut your expenses. You may need to revisit your business plan and focus on your “winning” items—those that are profitable and sell well. How much do you want to make this year? Figure out that number (this salary should cover your living expenses at the very least) and work backwards. If your salary/net income should be 45% of your gross income, you can quickly figure out what you need to earn in full for the year. Then break that down by month and then even week. Is that number attainable? If not, start brainstorming. What would you have to do to make that many sales in a week or a month? Looking at the numbers can be scary, but avoiding them won’t save you from ruin. The best part about checking things out under the hood is learning what needs to be fixed and formulating a plan. 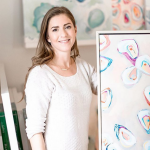 Stephie Jones is a fine artist living and working in Virginia Beach, Va. A graduate of James Madison University (2002), she paints bright, lively and colorful work in multiple mediums including oil, acrylic and watercolor. Her work (original paintings and limited edition prints) is released in collections on scheduled release dates on her web site, stephiejones.com. Release dates and sneak previews of her upcoming work can be found on Facebook (facebook.com/stephiejonesart/), Instagram (instagram.com/stephie_jones_art) or by signing up for her e-newsletter. Thanks for sharing this great, easy to understand, helpful article, Cory. And thanks to Stephie Jones for writing it! Bookkeeping is such a necessary evil of any business. As a bookkeeper myself by day, the numbers don’t lie! Sometimes you need to revisit your artwork and prices and wear all the different hats of running a business for it to work. Love this article thanks!